Will we see a special stipulation added? Over the past hour, several fans have taken to social media saying that WWE accidentally announced that the SmackDown Tag Team Championships Match at WrestleMania will be a TLC match - although they have since removed the post. At WrestleMania, SmackDown Tag Team Champions The Usos will have their first ever match on the WrestleMania main card when they defend their Championships against the Bludgeon Brothers and The New Day. Given that three teams will contest for the titles, and with the Dudley Boyz being inducted into the Hall of Fame two nights removed, there's been a lot of speculation that the match may indeed be a Tables, Ladders and Chairs Match. 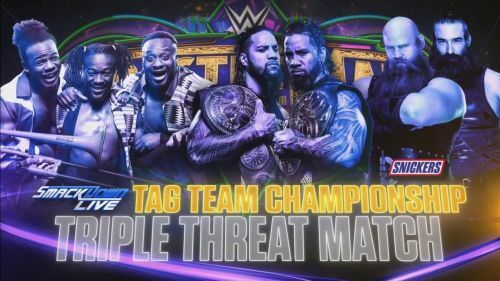 Well, it looks like that speculation may soon be confirmed as fans have taken to social media and forums to say they spotted on the WWE app that the match was being advertised as a TLC Triple Threat Match. The Usos and New Day have had an incredible rivalry over the past year, but Harper and Rowan interrupted their match at Fastlane, destroying all five men. After last night's official announcement of the match, this stipulation could very much be the icing on the cake - and make an already exciting match a must-see! The card for New Orleans is already stacked, but if this Triple Threat Match on the Grandest Stage of them All becomes a TLC Match, it could potentially steal the show. WrestleMania 34 takes place on April 8th from the Mercedes-Benz Superdome in New Orleans, Louisiana and already features the wrestling debut of Ronda Rousey, AJ Styles vs Shinsuke Nakamura, Brock Lesnar vs Roman Reigns and the in-ring return of Daniel Bryan. This year's event seems to get bigger and better by the minute! We'll keep you updated on this one as we get it. What will be the best match at WrestleMania 34? How long will each match be at WrestleMania 34?